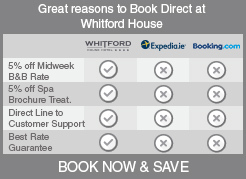 If you are looking for a self catering hotel, Whitford House Hotel offers an extraordinary option located adjacent to the hotel. The newly renovated Brambles is a self contained unit that is just as charming as its name suggests. Our self catering accommodation is a popular choice for those seeking family breaks in Ireland, or wedding guests in the area. This unique home away from home offers you the perfect space to enjoy a family staycation or is ideal when attending a local wedding or event. This self catering option is a delightful four bedroom accommodation that can sleep up to a maximum of eight guests. With a private lawn area and courtyard perfect for alfresco dining, this accommodation provides an alternate option to enjoy with family and friends. Four bedroom accommodation (sleeps up to eight people). Accommodation includes 1 king-size bedroom with en-suite (can be twin room alternatively),1 King bedroom (can be changed to twin room), 1 Double and 1Twin. To compliment your stay you may enjoy to our Leisure Club which includes our; Spata Gold Medal Award winning 20m pool and children’s pool, tranquil hydrotherapy, relaxing Jacuzzi, and a full gym. Our grounds offer a play area where your children may enjoy fun and games. Explore the paradise that Wexford has to offer, book today! For rates and availability, please call us on 053 91 43444. Old Boley Country House is also highly recommended as a self catering option for those looking to stay in Wexford.